As more architects, builders, and contractors strive to meet client demands for sustainability, one material stands out from the crowd. The most abundant mineral in the earth’s crust, aluminum is derived from bauxite, which is mined in several different parts of the world. Custom aluminum extrusion utilizes proven aluminum alloys to create many different parts, components, and products for the home improvement industry, including traditional aluminum frames, railings, and popular energy-efficient aluminum doors and windows. Sustainable aluminum extrusions are an excellent choice for architects who are striving to achieve LEED certification status for construction projects, as well as for individuals who are engaging in home improvement remodeling efforts. In addition to being extremely plentiful on earth with no concerns about over-mining or depletion of resources, aluminum is also highly recyclable. Most of the aluminum extrusions produced today are made with a high volume of recycled content, as this fantastic metal can be recycled over and over again without losing any of its inherent qualities. Recycling will not compromise function, strength, durability, or aesthetics, making it extremely attractive to manufacturers across many different industries. Above all other metals on the planet, no other is recycled with such intensity and frequency as aluminum. Our sustainable aluminum extrusions at Silver City Aluminum are made using billets that are sourced from 99.9 recyclable aluminum. Regardless of any other alloying metals that are included in your custom aluminum extrusion, the material itself can be fully recycled. Beyond the use of quality billet from local suppliers, we also pre-cut the billets according to the length and weight of the profile to minimize scrap and reduce waste. There are many reasons to select aluminum as a chief material for home improvement projects, including remodeling and renovation. Traditional aluminum frames provide quality solutions at a fraction of the cost for purchase and installation compared to steel counterparts. Aluminum doors and windows can be used, along with aluminum roofing solutions, to cut energy consumption requirements for most residential, commercial, and industrial properties. Lightweight – Approximately one-third the weight of steel, iron, copper or brass, aluminum is easier to handle, costs less to ship, and is an excellent choice in applications where reducing weight is a priority for construction. Strength – The alloys used for these sustainable aluminum extrusions can be made just as strong as the client needs it for most applications in the extrusion process. Strength can be concentrated through custom profiles for thicker walls and internal reinforcement. Unlike steel, which becomes brittle in cold temperatures, aluminum increases its strength as the temperature drops. Durable and Flexible – Aluminum is extremely durable in a wide range of environments, but it also combines strength with flexibility. This makes it ideal for applications where the metal needs to flex under loads or spring back due to the shock of impact, which is why it is used in automotive manufacturing. However, these qualities are just as beneficial in home improvement products where durability and flexibility are a priority. Corrosion Resistance – One of the best features associated with aluminum materials is that they offer excellent resistance to corrosion. A natural aluminum oxide layer forms on the surface of the materials, providing protection that can be further enhanced through anodizing, powder coating, painting, and other finishing processes for use indoors and outdoors in the home improvement industry. Thermal and Electrical – Aluminum also conducts heat and cold better than most other metals, making it a great choice for heat dissipation or heat exchangers. It is also an excellent conductor of electricity, in fact, it is twice as conductive as copper. Aluminum offers a lower-cost alternative for electrical connectors. The “Nons” – Other advantages include that aluminum is non-toxic, non-combustible, and non-magnetic. All of these properties make it a great choice where electronics, magnetic fields, high-voltage applications, and other issues must be taken into consideration for construction. Still not convinced about the benefits of sustainable aluminum extrusions? Contact our engineering and development team to discuss your needs for home improvement industry parts, components, and products. 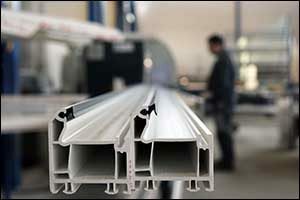 Standard and custom aluminum extrusion solutions are available for everything from traditional aluminum frames used in construction to aluminum doors and windows for reduced energy consumption. Call today at 508-824-8631 to speak with a representative about your unique needs and requirements for manufacturing.